* Must be 18 years old to purchase ticket and winner is responsible for registration *Winner does not need to be present to win*It is the winner's responsibility to abide by Louisiana state laws and regulations*Proceeds benefit the Cheering for Breanna Foundation*We will deliver up to 60 miles from our location. Stay tuned on Facebook for all the locations to where we will be selling the tickets, or you can email info@cheeringforbreanna.org Thank you!!!!!!! Kendra Scott Gives Back Party was a huge success! You shopped and they gave $2,566.71 back to our foundation. Thank you Kendra Scott for being such a compassionate company who gives back to charities all across the U.S. Our foundation is thankful for your support. 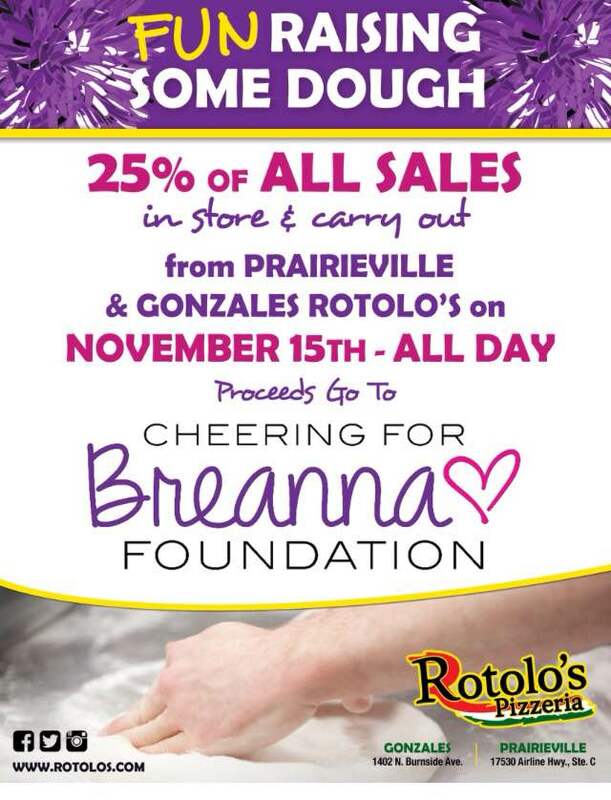 Rotolo's Pizzeria held a fundraiser for our foundation. Anyone who ate or ordered out, played a part in giving back. The turnout was great! Thank you Rotolo's for giving back $941.19 to our foundation. We are thankful for your support.